This is my current favorite and latest build. This is the cure for any single-ended amplifier addiction. It is built on a 17″ x 10″ hammertone-painted steel chassis, and features Transcendar output transformers and an Edcor power transformer. 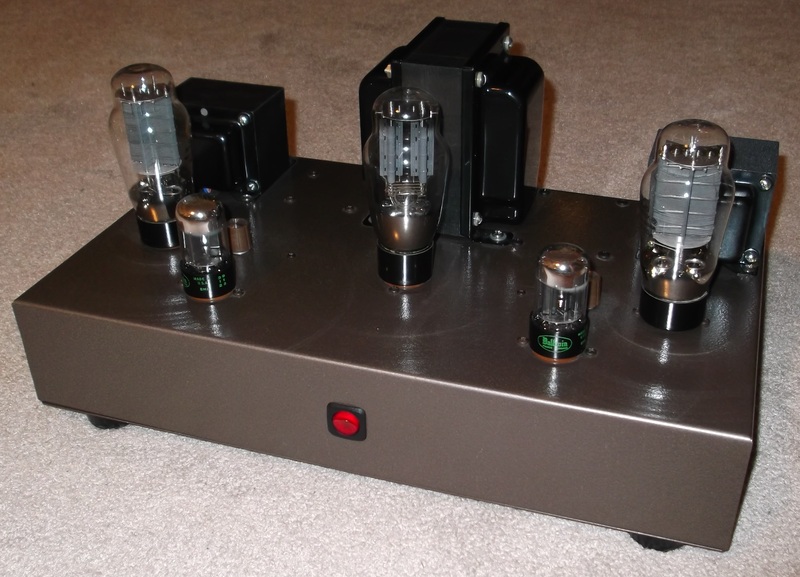 This is the first directly-heated triode amplifier I built for myself, and had the time to wrap my ears around. It’s an amazing synergistic match to my sealed-enclosure speakers, and sounds outstanding at moderate listening levels. This is as simple as such an amplifier can be, and I always believed shorter is sweeter when it comes to audio signal paths. The two 6SN7 triode sections are directly coupled, with one capacitor coupling to the output tube. All stages are cathode-biased and bypassed to ground. A worthy experiment might be to connect the output tube cathode bypass cap from the cathode up to B+, a connection often referred to as ‘ultrapath’. The power supply is very ordinary, but has a high inductance high current choke to keep hum down. The heaters and filaments are all supplied a rectified and filtered 6.3 VDC. Hum balance potentiometers are used across the output tube filaments so any hum there can be adjusted out at that point. See the global feedback? Nor do I! There isn’t any! This runs open-loop. The large output triode should help to keep output impedance down, but it will still be somewhat high, so damping will be poor. This requires the right sort of speakers to use effectively. When it does work out, it has punch, bounce, and puts you right there with those musicians. The bad news? This amplifier will reveal all of your poorly recorded music, and change your musical tastes to well recorded music. What is the voltage rating on the coupling capacitor? Probably 630V, because that’s what they sell. Anything higher than the power supply voltage always works! And what are the FWB squares on the filament supplies ?